You are currently browsing the tag archive for the ‘OpenSim’ tag. You go for years waiting for a competitor to Second Life, and suddenly three come along at once. Ok, that’s a bit of an exaggeration, if not to say completely misleading, but it does kind of sum up how I feel right at the moment. In the last few weeks some open-source versions of Second Life have emerged into the wild. They are still in early stages at the moment (think of them as alpha releases at best), but promise to develop very quickly into something very useable. They also start to open up the possibility of a truly distributed 3D web (more on that later, but for me it is one of the most exciting aspects of these new developments). First, a quick introduction to the applications in question, and how they relate to one another. This one has the potential not just to outdo Second Life, but to knock it out of the ring altogether. At the moment the performance is worse than Second Life on a bad day, and a lot of features are missing or incomplete. It still manages to be breathtaking. There is both a server and a viewer available. Let’s look at the viewer first, which is so similar to Second Life’s viewer that I’m not even going to bother with a screen shot. 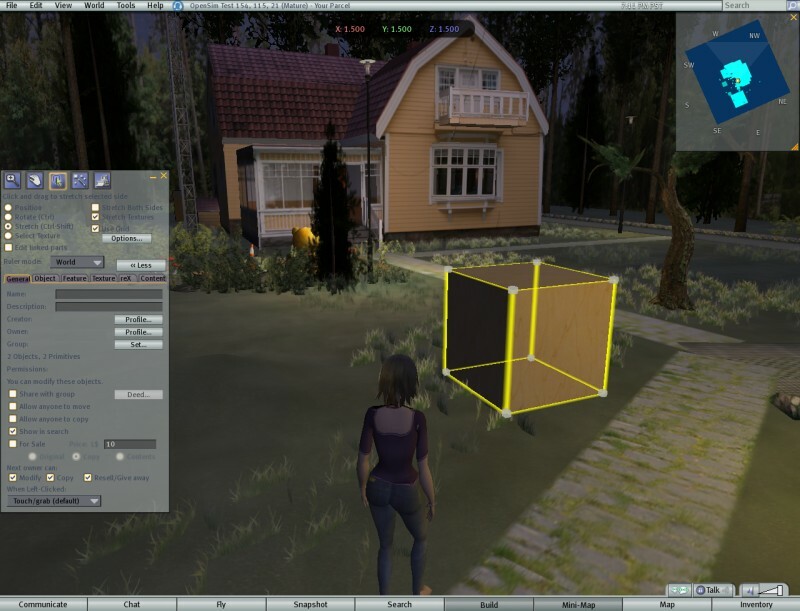 One significant point is that the viewer can be used for Second Life itself, and can also be used to connect to other servers/grids, such as the Open Life grid mentioned below. However, RealXtend comes into its own when you use the ReadXtend server with it. You can download the server and run it on your own computer. Yes, your own local world — and yes, other people can connect to you, provided you tell them the correct IP address and port to use (no, this isn’t straight-forward — I told you this was early days yet). Let’s take a closer look, and let’s do a bit of creating. Ok, it’s just a simple block with a new texture, but at least it proves it works. Take a look at the surroundings, though, which come as default with the server. Very impressive. At the moment, there is no facility to change your own appearance, so you are stuck with the default avatar. At least she is slightly more interesting than Second Life’s notorious ‘Ruth’! As with RealXtend, OpenLife comes with both a viewer and a server (both downloadable for free, again as with RealXtend). They are also providing the ability to buy regions on the OpenLife grid, in a similar fashion to the Second Life model. The viewer, once again, can be used to connect to the OpenLife grid, or to the main Second Life grid (I assume you could also use it to connect to a RealXtend server, but I haven’t tried this myself). This is a third entrant in the list of open-source servers (there doesn’t seem to be a browser with this one, instead you use one of the existing browsers to connect). I haven’t investigated this one myself, not even to the extent of downloading it and trying it, but I intend to do so very soon. Ok, so much for the programs themselves. There has been quite a buzz around them, and a lot of discussion, but I think that many people miss the point of what is going on here. The most significant point is that it is possible to host a Second Life type of world on your own computer (you’ll need a decent connection! ), and invite your friends to come and visit you, using a free downloadable browser. It looks as if many of the browsers will be cross-compatible, though I do see the scope for a new type of browser-war! It will also be possible for companies to set up their own grids, and sell regions on it, somewhat like Second Life does at the moment, but instead of one central grid, there will be lots of them. The result will be very much akin to the world wide web, where companies host websites. Avatars will be able to move between these worlds, taking their inventory with them — this is a crucial point (see the RealXtend website for a more detailed explanation), and makes this whole idea not only work, but actually useable and useful. As I see it, the one thing missing is the equivalent of hyperlinks, to allow you to jump from one world to another. This would not be particularly difficult to implement — essentially you just restart the browser, pointing at a new location. It could be done in a manner similar to the existing teleport feature in Second Life. The trick is being able to find out where those other worlds are, as easily as you can find websites, a problem that has still to be fully addressed by the existing systems (but not, I think, a particularly knotty problem). There are other issues that will cause existing Second Lifers problems, partly because of Second Life’s own peculiarities. For example, Second Life has an economy (a completely fake economy, of course, something which many people seem unable to grasp) — this is not going to transfer over to the 3D Web. How can it, when potentially everyone is running their own world, and has complete control over it. If you want to earn money, it will mean using a real-life economy, with real-life cash. Security might also be an interesting issue, but possibly one that is more easily handled than in Second Life. If someone comes to your world, can they do anything they want, or do you have complete control over what they are allowed to do? I suspect that the latter is easily possible in theory, but has not actually been implemented in practice (the current emphasis has mainly been on recreating Second Life’s features). Certainly, giving each independent world complete control over security opens the possibility of allowing functionality that has been excluded from Second Life purely because of the potential for abuse. I shall be interested to see how the security issues are tackled in these new worlds. It’s a little too soon to declare “Second Life is dead. Long live the Open Web!” but I feel that it won’t be long. Maybe one or two years at the most.